While in Myrtle Beach this summer, we took a break from the heat to explore the Children’s Museum of South Carolina. Located just a few blocks from the Boardwalk and the beach, it was very convenient to get to, although a little tricky to find. Pulling up, the outside of the building is very non-descript and I couldn’t tell what to expect once inside. We were blown away by all the fun activities in here! We stayed for two hours and still didn’t do everything! Our 7 year-old found tons of things to play with and explore. 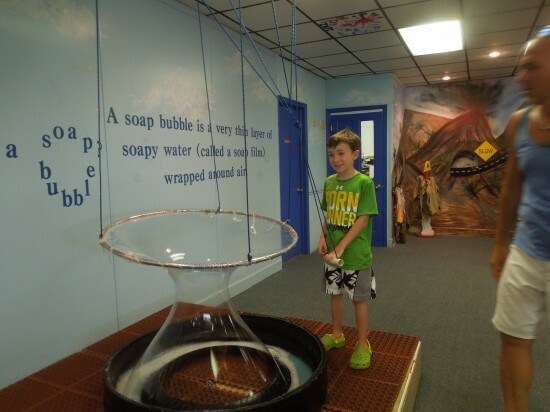 This place is great for a variety of ages, making it a must-see in my opinion for your trip to Myrtle Beach.This small, non-profit museum puts all it’s energy into the exhibits, and there are plenty! The website lists 19, but there are easily that many more. My son enjoyed them all from the circuits (above) to the giant bubble maker (below). Most of the exhibits are fun for toddlers, and young school-aged kids will still enjoy them, too. Some other favorites were the electricity station where by turning a crank, kids can turn on the street lights in a miniature town! 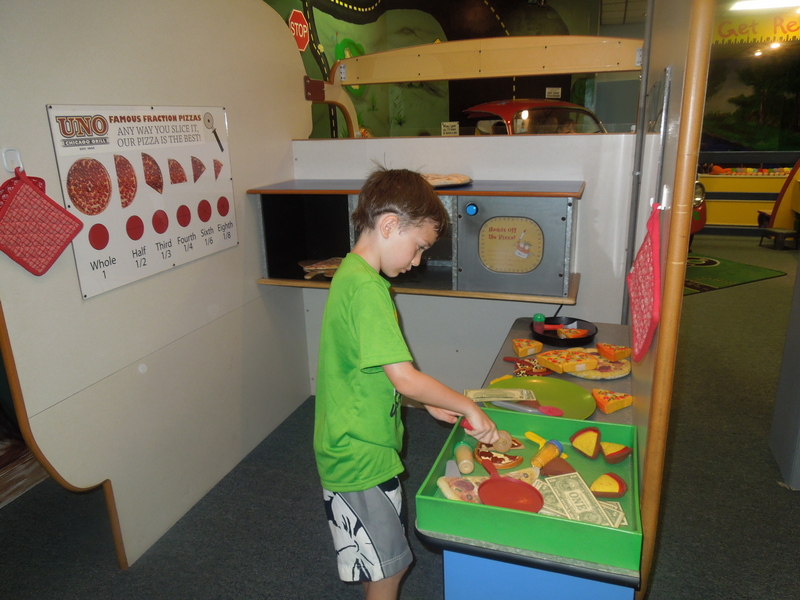 No children’s museum would be complete without a play kitchen, and this one has TWO! One is the standard favorite, the other is a fun pizza kitchen inside a delivery truck. The kids can ‘make’ the pizzas in the back, ‘bake’ them in the ‘oven’ (push a button and a red light turns on to ‘bake’ the pizza), then ‘drive’ the delivery truck. This was a fun twist. Turtle Travels is a temporary exhibit open through January 5th, 2013. This exhibit alone has at least 5 stations to play and learn about the life and struggles of turtles from a life-sized board game to a terrarium with live turtles. 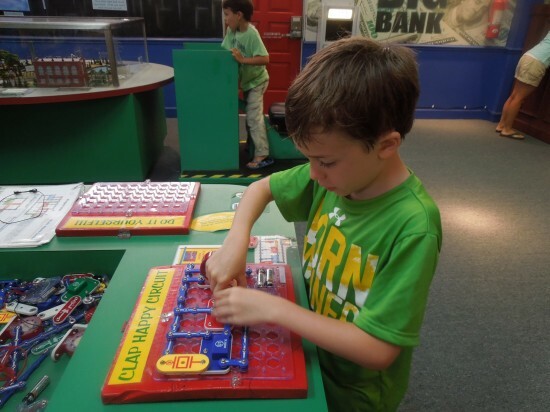 Some of the other exhibits include: a bank – spin the wheel to learn about spending and saving, newscaster station, boat, puppet show theater, art area – coloring pages, painting, etc., dinosaur dig area – with fossil rubbings, learn about recycling, panning for gems, drawing with sand, and so much more! Each area is the perfect size for short attention spans to breeze through, yet with enough of an educational element to keep those more interested able to linger for deeper exploration. The Children’s Museum of South Carolina is a great way to spend an indoor day – take a break from the sun, rain, or cold. This is a perfect year-round destination, and one not to be missed whether you are here for vacation or live nearby. If you’ve been here, share your favorite exhibit in the comments below! If you need a hotel nearby, book with us and enjoy our 100% Best Rate Guarantee! I ran into this page accidentally, surprisingly, this is a wonderful website. The site owner has carried out a superb job of putting it together, the info here is really insightful. Now I am going to bookmark this internet site so that I can revisit in the future.